LPVO stands for Low Power Variable Optic which has come to define any riflescope with magnification range starting at 1x or close to it. Almost every manufacturer has one of these in the stable and sometimes more than one. For example, I took a brief glance at the Burris website and found five of them in about 12 seconds flat: MTAC 1-4x24, RT-6 1-6x24, XTR II 1-5x24, 1-8x24 and 1.5-8x28. 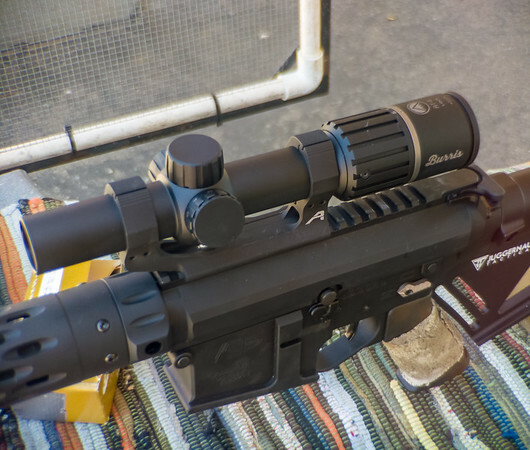 While riflescope technology in general has been advancing quite rapidly in the last decade or so, LPVOs have, arguably, improved more than any other scope type. They vary tremendously in price, quality and performance. Given an incredibly variety of what is out there, it is very easy to fall into the trap of selecting a scope based on published specifications. While specs are important, they do not tell you the whole story, nor do they tell you if a given scope matches your application. Application is where it all starts. LPVOs are usually purchased by people running ARs of all sorts (or other competing semi-auto carbines), so I will mostly addressed this use case. 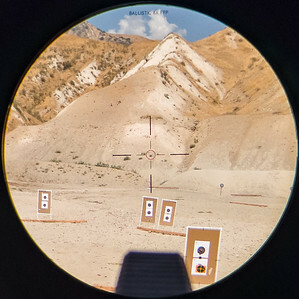 If all you want to do is go fast and your shooting distance is not likely to exceed 75-100 yards, you are likely to be better served by a non-magnifying red dot or holographic sight. Modern red dot sights are quite reliable and have exceedingly long running batteries often lasting several years of moderate use. LPVOs become a better solution if you want to do more than that. Most importantly, the ability to get a little magnification is key if you want to extend the distance. Also, if you have astigmatism that makes a red dot look like a red blob of indeterminate shape, get an LPVO of some sort and thank me later. Now we are getting to the fun part: how do I choose one? In the picture below, XTR II 1-8x24 on the left costs three times what the RT-6 1-6x24 on the right does. Both are good scopes, but there is a reason one is more expensive than the other. Fundamentally, if you are looking at a 1- “something” scope, your application likely requires that the scope will spend some significant amount of time on 1x. How much time you’ll be on 1x varies, but low magnification performance has to be important. 1x means speed. No one uses a 1x riflescope because they are looking for precision. To get speed you have to have a scope with a large exit pupil on 1x, wide FOV, low distortion and an extremely easy to pick up aiming point. This is where we get to the compromise part: it is harder to get good 1x performance with a 1-8x scope than with a 1-4x, so if you are looking for a “do everything” scope that can be used to reach out to considerable distances in a pinch (i.e. 1-8x or so), prepare to spend some money. Same for “nuclear” bright reticle illumination. It costs money. There is a significant price difference between reticle illumination you can see during the day and reticle illumination that stands out during the day. Think carefully about how much magnification you really need. Decide on FFP or SFP reticle. 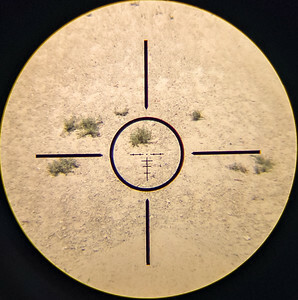 As a general reminder: if the reticle is in the Front Focal Plane (FFP), it will grow or shrink in size as you increase or decrease magnification. That means reticle subtensions will be accurate regardless of the magnification, which is important for shooting a bit further out for both trajectory compensation and POI correction. If the reticle is in the Second Focal Plane (SFP), it will look the same as you change magnification and as the image details get bigger or smaller. That means reticle subtensions will only be accurate at one magnification, usually the highest. For LPVOs that top out at 6x or below, both FFP and SFP reticles work just as fine as long as they are well designed and well implemented. However, in the real world, most people use these LPVOs either on 1x or on the top magnification, so you will likely get more for your money with a SFP scope. They are a little easier to build and making sufficiently bright illumination is easier with SFP reticles. 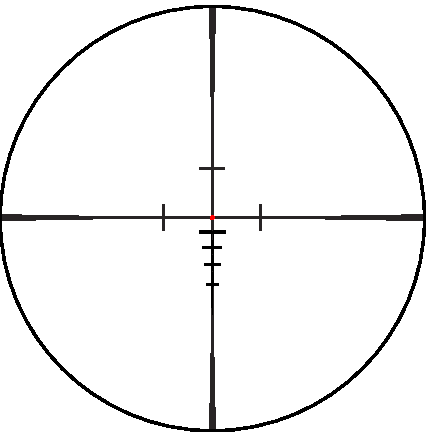 Burris RT-6 Reticle: clear primary aiming point, a few unobtrusive hashmarks for holdover, lead and wind. Simple to use without any unnecessary complexity. When does FFP make more sense? As top magnification goes up above 6x, FFP starts making more sense. The biggest reason for that is the exit pupil. At 8x with a 24mm objective, that exit pupil is 3mm which can be a little constricting if lighting conditions are sub-optimal. What that means in practical terms is that you want to be able to dial the magnification level to whatever looks reasonable for the conditions and have the reticle remain calibrated. That means FFP reticle. With FFP reticle you do not need to know what magnification you are on. You can keep looking through the scope as you adjust the magnification to whatever looks appropriate. 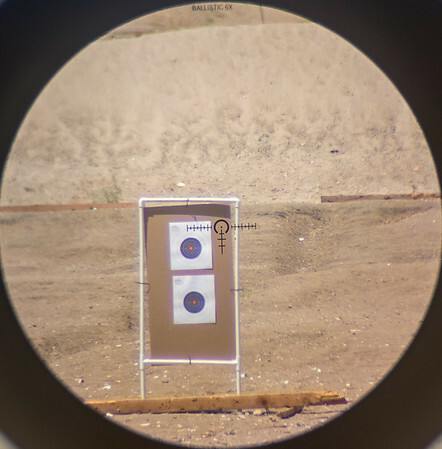 Basically, if you will be engaging targets at distances that require holdover, you will likely be doing it somewhere in the 5x to 8x range and there FFP reticle offers an advantage. Reticle design is trickier with FFP scopes as is reticle illumination. However, there has been a lot of development happening there. Still, if you are looking for a good quality FFP LPVO, it will cost you some money. As I write this, Burris XTR II 1-8x24 is about the lowest price high quality option out there. There are several excellent designs out there that will cost you a lot more and a couple in a similar price range. All the ones I have seen in lower price ranges that combine 1-8x magnification and FFP reticle are not good enough so far. While wide FOV on 1x is important, it is more important for that FOV to be flat and free of excessive aberrations. You will not find that information in product catalogues, so listen to user reviews and ask questions. Look for reviews from people who are detail oriented. Something that can be reduced to “Dude, this scope rocks!” is not terribly informative. 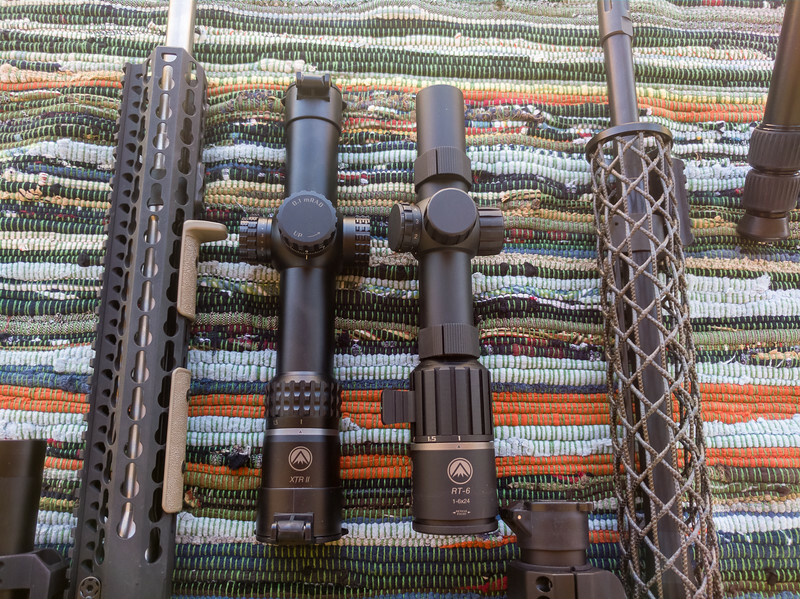 Exposed tactical turrets look great in pictures, but they are used so seldom on LPVO scopes that your best bet is to stick with either covered or locking turret designs. And finally, figure out how much you are willing to spend. Not how much you want to spend. How much you are willing to spend. Those are usually different numbers. If you are on a budget, keep your requirements simple. -Burris RT-6 is about as low as you want to go in price. The scope is very solid optically and mechanically, but the reticle is in SFP and is not day bright. -Next step up is Steiner P4Xi 1-4x24. It is still SFP and you lose a little magnification on the top end, but gain better optics, better 1x performance and a day bright aiming dot. -Another step up in price is Burris XTR II 1-8x24. Here you can get an FFP reticle and a broader mag range, but you will pay more. This is more of a general purpose scope for a precision carbine where you expect to extend the range of the gun.